In Part 1 of this series, you learned some Unix/Linux (*nix) basics covering general security, filesystem layout, comparable DOS commands, and directory structure. In Part 2, I take you deeper into the *nix filesystem, filesystem navigation, and file manipulation. In the past few years in the *nix space, filesystems have gone through somewhat of a standardization or convergence. That’s a good thing for cross-platform system administrators who must work on a variety of systems without becoming an expert on every one. By convergence, I mean that there is more of a standard look and feel for *nix filesystems from one “flavor” to another. If you’re familiar with the layout of a Linux system, you can easily navigate and find critical files on just about any other modern *nix system. A number of directories are common to all *nix types (e.g., / , /etc , /var , /tmp , /usr , /bin, and a few others); however, one particular directory is not consistent from one flavor to another, and that is where the kernel files reside. For example, in Linux, you’ll find those files under /boot , but in HP-UX, they’re under /stand . In other *nix types, the kernel files reside in /kernel , /vmunix , or under multiple subdirectories of /usr . The takeaway of this is that you need to recognize that there are going to be subtle differences in the layout of *nix systems. The important configuration files are always under /etc . For some applications, you might also have to look in /var or in /opt . As you become more familiar with Linux or another Unix flavor, you’ll learn that each system has its own quirks and idiosyncrasies. Figure 1 reviews what the Linux filesystem looks like from the / (root) directory. Figure 1: The Linux root filesystem and its many subdirectories. From this overview, you can do some spelunking on your own. First, you’ll need to know some basic commands and the functions they perform. As at the Windows CMD prompt, you traverse directories and subdirectories with the cd command, with a few subtle differences that you’ll have to get used to along the way. For example, typing cd by itself returns you to your home directory. In Windows, the system returns your current working directory. The equivalent command to do that in Linux is pwd (print working directory). No matter where you are on a *nix filesystem, you can use the cd command to return you to your home directory. which is now my new current working directory. Of course, on your system, your home directory will have your username, not mine. The basic ls command displays very little information about the directory’s contents except for file names. On most Linux systems, the ls command shows you a color-coded file listing, as shown in Figure 2. 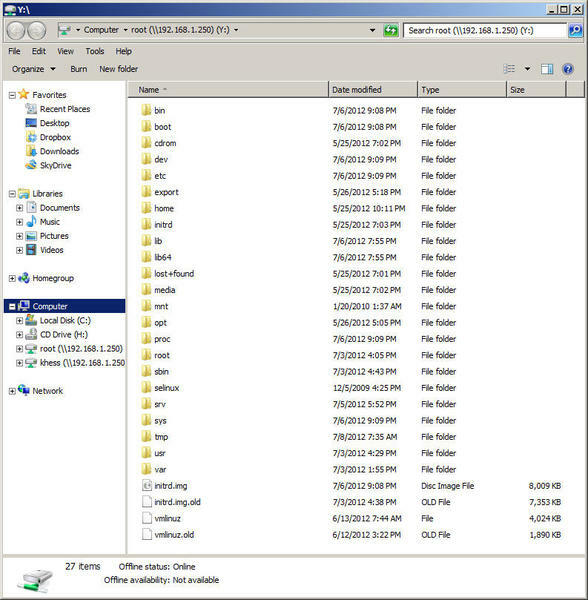 Figure 2: PuTTY Window displaying a file listing in my home directory. Most *nix systems don’t have the advantage of a color-coded file list. Although Linux displays directories in blue, text files in white, compressed files in red, and graphics files in green, if your system doesn’t color code, you have to rely on ls command “switches.” Switches are options that you pass to a command to elicit some nondefault behavior. Windows commands have switches, too, but they’re used less often than on *nix systems. The -F switch means that you want ls to display each file’s “classification.” Directories are shown with a trailing slash. Text files have no designation. Links have a trailing @ symbol. To nearly mimic the default DIR command of Windows, try the ls command with the -al switch combination. This partial listing is only a few of the files in my home directory. When you enter the same command on your system, you might see files that begin with a dot (. ), which indicates they are hidden files. If you want to hide a file in *nix, name it with a leading dot. However, the file is only hidden from standard ls commands. Both systems should list files in order of modification date, with newer files shown at the bottom of the listings. Note: On many Linux systems, dir is an “alias” for ls . Try it on your system to see if it works. I’ll discuss aliases in detail in a later article. By file manipulation , I’m referring to creating, copying, removing (deleting), moving, renaming, and editing files. A directory is also a file in *nix. In fact, everything in *nix is a file. For the purposes of this lesson, file refers to plain text or a directory. 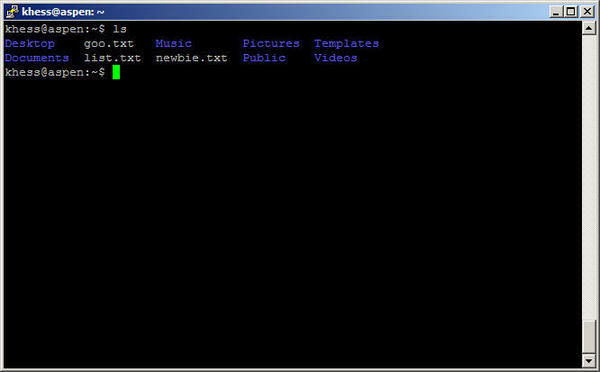 which creates the empty file file1.txt in your home directory. If you can’t create this file, use the cd command to return to your home directory and try again. which puts the sentence, “This is one way to put text into a file.” into file1.txt . In fact, you overwrote file1.txt with a new file with the same name because you used the > operator. If you want to append the sentence to the file, use >> as the redirection operator instead. To view the contents of the file you created, use the cat command. Remember, from Table 1 in Part 1, cat is equivalent to the TYPE command. This is one way to put text into a file. This is one way to create a file and put text into it. This is the way to append a file and put text into it. I’m going to warn you now that, when you start scripting, you will forget to append to the file, and you’ll spend hours debugging very simple scripts because you forgot to use the >> . Everyone does it, so be prepared. This copy (cp ) command creates an exact duplicate of file1.txt as file2.txt . Copying a file is an excellent backup method. You should create a backup copy of any configuration file before you edit as the root user so you can revert back to the original should you make a mistake or alter important formatting. To backup a file properly before editing, you how to become the root user for limited access. In Part 1, I briefly mentioned the sudo (pronounced soodoo or soodoe) command, which allows you to run commands as root one at a time from your regular user account. Think RunAs . The file file1.txt is copied, preserving permissions (-p ) to file_bak.txt . Instead of asterisks, when you type in your password, you’ll get no feedback. The sudo you’re prompted for is your password. The system verifies that you are who you say you are; otherwise, someone else could walk up to your screen and type a command as root. Your power as root with sudo only lasts five minutes, so you’ll have to reauthenticate after that. This ensures that no one else can simply walk up and grant themselves root access to a system into which you’re logged. Some systems are very restrictive and only grant sudo access for a limited number of specific commands. Other systems are less restrictive and allow you to run anything as root with this method. Access by sudo is configurable by the root user and is managed by a special file and a special editor for that file. I’ll cover this in more detail in a later article. The system assumes you want to move the file to your current directory if you don’t specify a location. Removing a file on *nix systems is easy – too easy. Unlike Windows, the system does not ask you if you’re sure. The *nix systems assume (often incorrectly) that you know what you’re doing and that you really want to remove a file. Removal is irreversible. No Recycle Bin preserves deleted files. Creating a directory on *nix systems is exactly like creating them on Windows systems at the CMD prompt. Although Windows systems use an alias for MKDIR (MD ), the syntax is the same. The copy (cp ) command works for empty directories or for directories that you want to copy; however, for those that contain files, you’ll have to perform something close to an XCOPY /S on them. This command copies the directory and all of its contents recursively and preserves all permissions on all files and subdirectories. An ls will show you that the directory has been created. You can place files in it, remove it, move it, or rename it, just as you would any other file – with some exceptions. You cannot remove a directory if it has files in it. This command removes the specified file (directory) recursively with the force (-f ) switch. The directory newdir and every file contained in it is gone. Caution: Using the rm -rf command is dangerous, so use it thoughtfully. If you issue the command in the wrong place as the root user, you could remove every file under the directory you specify – even the / (root) directory – and doing so will render your system useless. The topics covered in this article are relatively simple but they require practice to master adequately. Practice them on your system until you feel comfortable with each one. Remember to back up any system file before you edit it, and preserve its permissions. This one lesson will become increasingly important to you as you become more competent as a *nix system administrator. Start with good practices now, even as an individual user. Next time, I’ll cover advanced file editing and some advanced file manipulation. Expect is a unique scripting language that emulates keystrokes by responding to expected responses from a local or remote system. Think of Expect as an automated, virtual you.